Enjoy the holiday and Easter celebration with your favorite stuff. 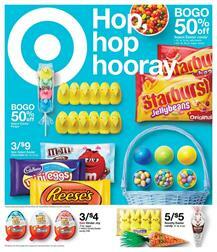 Toys, NFL ball, Spalding Basketball, and more products are in the range of Target Ad Easter sale. Browse the suitcases for your trips. If you have plans to go somewhere on holidays, you might need some of these. Fill your Easter basket with books. New books are available in on Tuesday. Buy new and exclusive movies in DVD or Blu-Ray at Target. Aquaman, Ralphs Break the Internet, and more movies are under $20. Shop for video games and game consoles. Xbox One, NBA 2K19, Fifa19, PlayStation 4 1TB console, and more are available in the game aisle. Buy Nintendo Switch Games for half price. You can also improve the indoor entertainment technology of yours. Upgrade to a better TV with Target prices. Also, browse wearable technology like Garmin. Smartphones like iPhone Xr is also one of the displayed items on the latest content of the regular Target Ad. Subscribe to the Target Ad to get the newsletter about future ads or deals. You can alternatively follow us on the Facebook page. More deals are waiting for you at the Target Store. Swimsuits, Easter clothing, free gift cards and more are available right now. 10% off men's tees. Valid 4/7-4/13. BOGO 50% off women's jewelry & accessories. Valid 4/7-4/13.